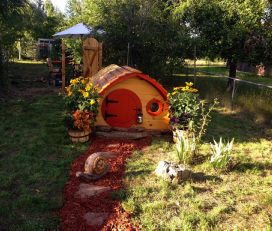 Hobbit Hole Chicken Coops, and More! We've got the world's best reason to keep chickens! "I am impressed by the excellent workmanship of these coops, and the engineering as well. They are a well thought out design. Easy access for cleaning and egg gathering, et cetera!" If you're looking for an unusual coop built to high quality standards that will exceed the needs of your flock (and your needs as the one who takes care of them) while also beautifying your landscape and standing out from the crowd, you've come to the right place. We like to say our Hobbit Holes chicken coops are the world's best reason to keep chickens, but if you've got one or two better reasons, we'll settle for a top three position. The Lightfoot coop measures 62" x 35" x 45"H and we recommend it for up to four standard breed chickens or up to six bantams, depending on the size of the breed and the amount of time your flock will be spending inside the coop. The coop comes with a total of 4' of perch space on a moveable perch that sits 10 inches off the ground. Our freestanding nest box can be positioned anywhere inside the coop (just inside either the round door or rectangular door is recommended for easy egg retrieval), and is easily removed out the rear clean out door when you're ready to clean the coop. Makes a great starter package! The run attached to the Lightfoot is 56" x 72" x 42"H. In the attached run version of the Lightfoot, the pop (chicken) door is is operable from outside of the run with a pull cable. Access the interior of the coop for cleaning through the hinged roof! Position the freestanding nest box inside the round front door of the coop for easy egg retrieval. On this version of the Lightfoot, the coop ships pre-built and the run requires assembly. The Proudfoot coop measures 85" x 51" x 52"H and we recommend it for up to 8 standard breed chickens or up to 12 bantams, depending on the size of the breed and the amount of time your flock will be spending inside the coop. The coop comes with a total of 8' of perch space on two moveable perches that are 10 inches off the ground. With the Proudfoot you get a freestanding stacking double nest box, for a total of two nest boxes. Our walk-in Hobbit Hole Chicken Coop for a flock of up to 25 birds! The walk-in Harfoot coop measures 120" x 72" x 66"H and we recommend it for up to 15 standard breed chickens or up to 25 bantams, depending on the size of the breed(s) and the amount of time your flock will be spending inside the coop. Four functional windows allow for ample ventilation and provide lots of natural light. The coop comes with a total of 24' of perch space and six nest boxes which can be positioned in front of either door for easy egg retrieval. Add a beautiful run to your beautiful coop! Constructed of all cedar curved rafters and framing and enclosed in 1/2" galvanized steel hardware cloth. 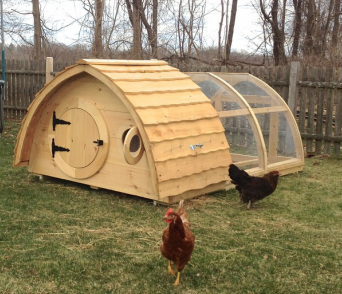 The run measures 10' x 12' x 6'2"H and can attach to the front or back side of the coop. End wall has a human sized door for easy access. Give us a call or go to our online store to order! top notch customer service from the same people who design and build the product! Our family business operates out of a small facility where the focus is on quality rather than quantity. Normal turnaround time on chicken coop orders is 2-4 weeks, but can be longer in our busy spring season. Please contact us before placing your order if your order is time sensitive to make sure we can get the order to you in time.